Waking up early to join the already impressive line outside the Fitzroy Town Hall at 8:45am on a Sunday morning was totally worth it for my carb-starved body. 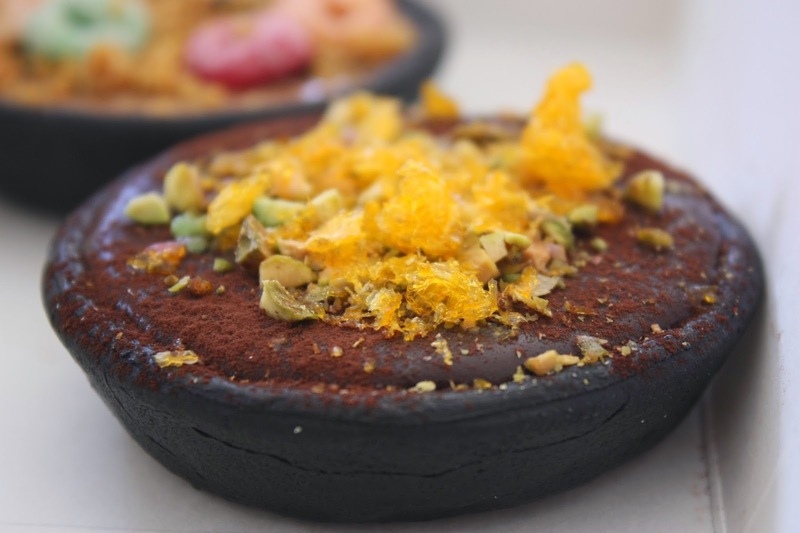 But here are a few tips for the seasonal Flour Market, held in various (hipster) locations in Melbourne. Don’t hesitate when you want to buy something, it will probably be gone when you look back. This is more for the stallholders but LABEL YOUR ITEMS, it will save a lot of time when you don’t have to explain every flavour of tart to every single customer. On to the food, chaps. 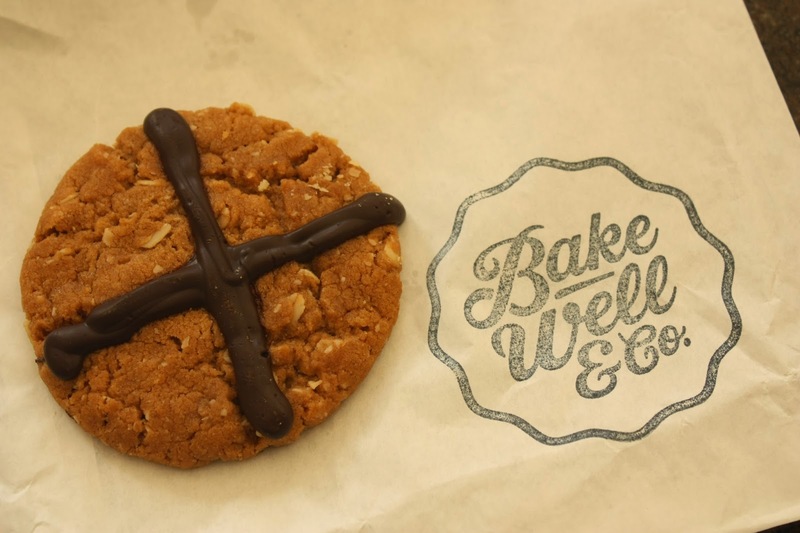 The Choc Cross Peanut Butter Cookie ($4.50) was amazing! I loved every bite and wished I bought more. The chocolate was soft and melty and the cookie was soft and chewy. So good. The Sweet Apple Pie Slice ($6) was also beautiful (but unfortunately no picture because it got squished in the frenzy of carb-loading). I loved the pie crust which tasted awfully similar to shortbread. The apple pieces inside were done to perfection – no random tough skins to bite through, or overly sweet. The only complaint I have, which made the whole experience a bit jarring, was the pastry at the bottom of the slice was completely raw, so I grilled it for a bit and got a nice piece of biscuit. A friend had a similar experience with the spiced pumpkin pie but despite this, we were both thoroughly impressed (he said I need to try the Key Lime Pie. I am excited!). 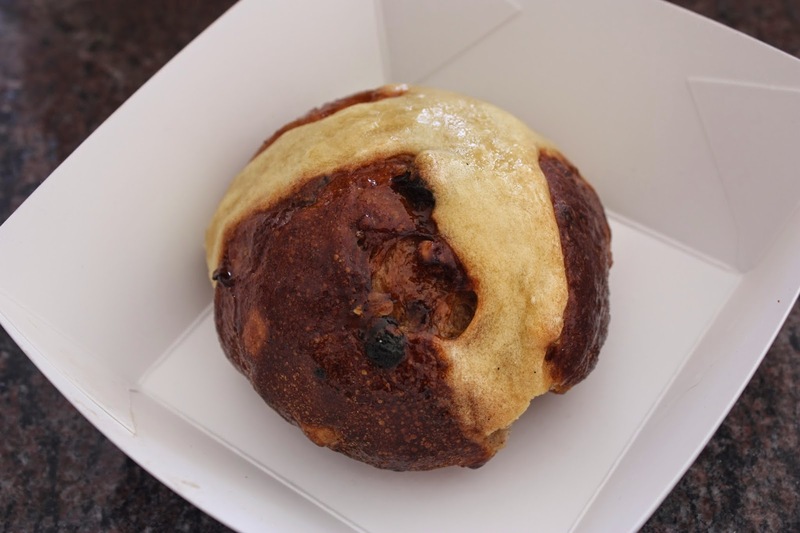 Tivoli’s Hot Cross Buns ($3.50) were recently declared as the best hot cross buns in Melbourne! So of course I picked one up to try. To be fair, I did eat it the next day, toasted so I didn’t get a feel of the “moist, with an appealing bounciness” described in the article. However, it was a delicious hot cross bun. It looked great and wasn’t too spicy or fruity – even with the orange rind mixed through. 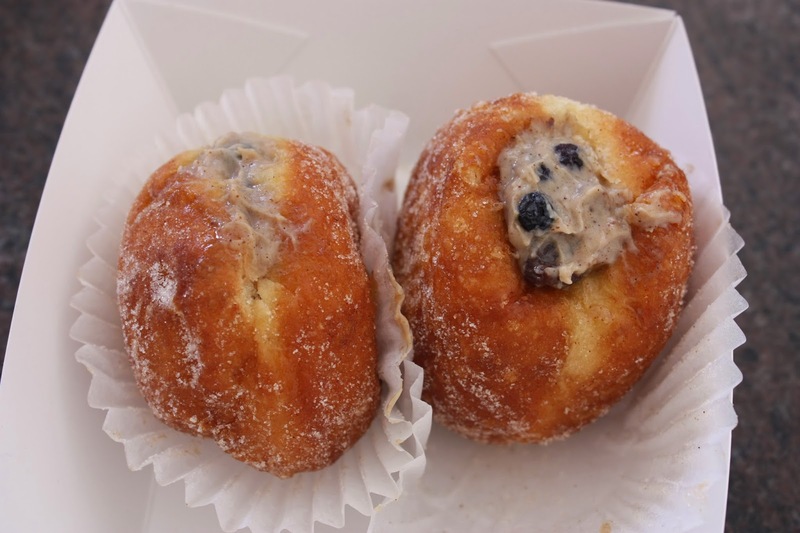 The famous Tivoli Cronuts did not choose to make a comeback at the Flour Market (but I will continue hoping) but they did have some hot cross bun stuffed donuts ($4.00).These to me tasted like Christmas pudding in a donut (but I don’t really enjoy Christmas pud so maybe it did in fact taste like a really well done Hot Cross Bun)! That is to say, it was lovely and spice-filled and delicious. The littler currants mixed in were a great addition. Tivoli sure know how to make people feel warm and fuzzy inside with their donuts. These guys were a massive hit, with the biggest line in the room. Desperately wanted to try the Quiche Lorraine, but alas we were too slow. So we settled for their Pie special which was chicken, corn, bacon and leek (I know right!) And yes folks, it tasted as good as it sounds. Lovely and creamy, and so darn tasty, there were huge chicken pieces in there which you could satisfyingly chew through, and all the ingredients complimented each other so well! We also got the Beef, Cheddar, Guinness & Thyme Pie ($8.50) holy moley. These guys know how to make their pies. The beef filling ate like a meal, a warm comforting winter meal; and the pastry was light, crunchy and oh-so-good. I think I have finally found a place that has beaten Pie In The Sky, and that is not an easy thing to do – and I’m happy because it’s a lot closer to get my pie fix now! 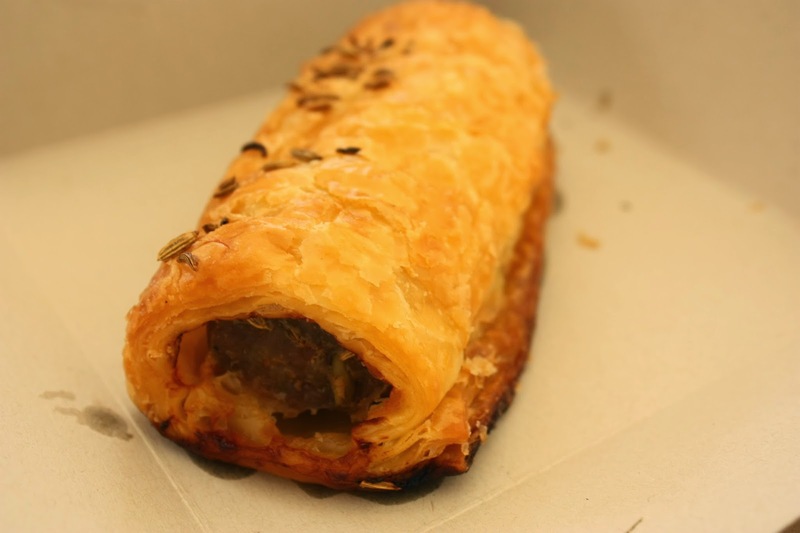 The pork, apple and fennel Sausage Roll ($6.00) which was delicious on first bite, but then I decided it was a little bland – probably best eaten with some of the relishes Pure Pie have on sale. 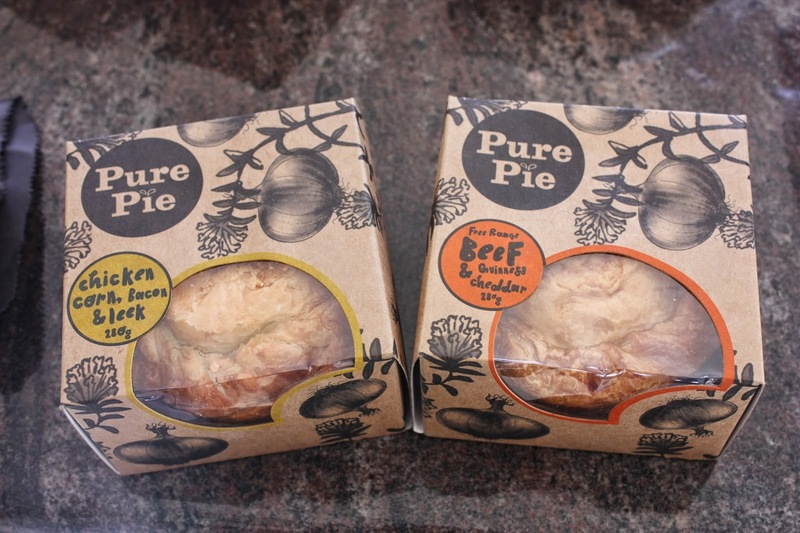 I would buy it again though, as the pastry around the meat was delicious like the pie base, but really let’s be honest, these guys aren’t called Pure Pie for nothing. This guy Raph, the mastermind behind Beatbox Burger amongst other things, is a genius churning out hit after hit after hit. 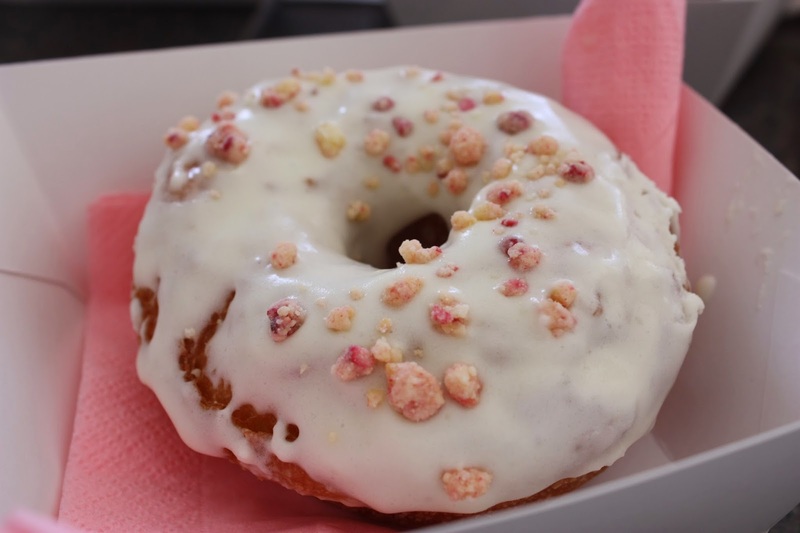 This beauty is the cream cheese glaze donut with milk berry rubble. 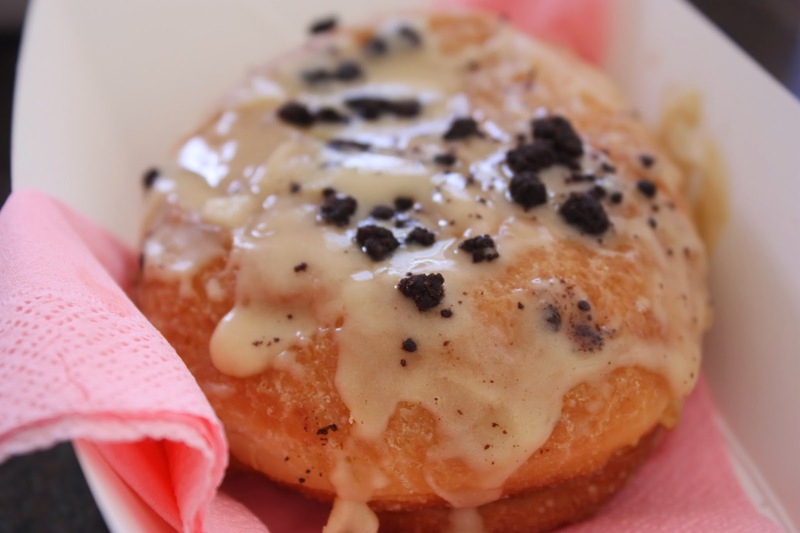 The icing on this puppy tasted so good, it was sweet and I could have dunked donut after donut into the glaze. For some, without this glaze the donut may be a bit bland or not sweet enough for some, but it tasted fine to me either way. The tried and true Passionfruit Curd with Coffee Glaze and Chocolate Rubble had and awesome passionfruit curd centre, a surprise that I probably should have seen coming. The curd was very well done, not being too sweet but so creamy! I much preferred this donut to the other. These stunning tarts looked gorgeous on the trestle table set up and the crowd around them eagerly jostled to be served. 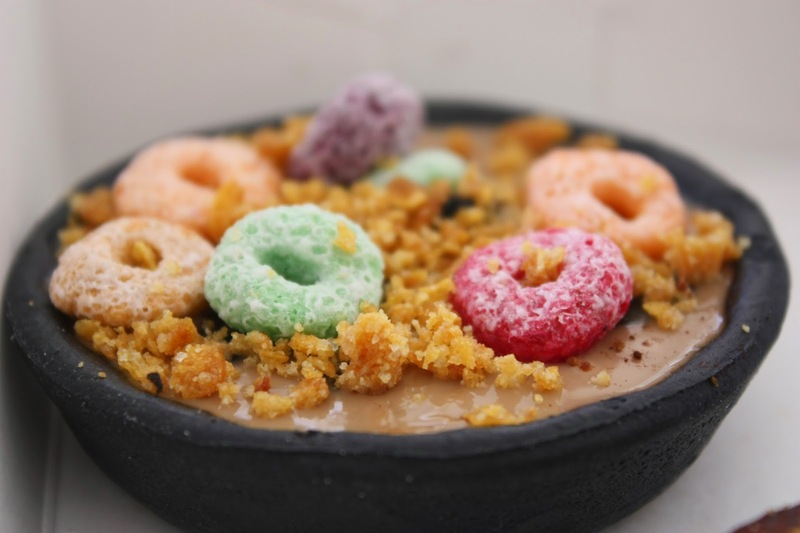 This Bonsoy Cereal infused Earl Grey tea, lady finger caramelised banana, grass jelly, cornflake crunch, dried blueberries/cranberries, and Froot Loops tart is a mouthful to say but not so much in taste. I felt like the tart had a strange flavour; like tasteless pastry with a strange after taste where I swear I could taste the charcoal mix, which gives the black colour. It is unfortunate as the pastry is usually what I look forward to the most in my tarts. I am unsure if it’s because the taste of charcoal is too strong (tasteless) or whether there isn’t enough fatty butter and sugar added. The contents were initially nice and creamy in line with the bonsoy tea, but then it got weird due to the combination of Froot Loops and grass jelly. I think they went a bit ambitious with the flavours and it didn’t balance for me. On the other hand, the chocolate ganache, mango, orange puree, pistachio and freeze dried mandarin tart was a lot better. Possibly due to the stronger and heavier taste the dark chocolate brings to the tart. The smooth chocolate filling was not too bitter and not too sweet. 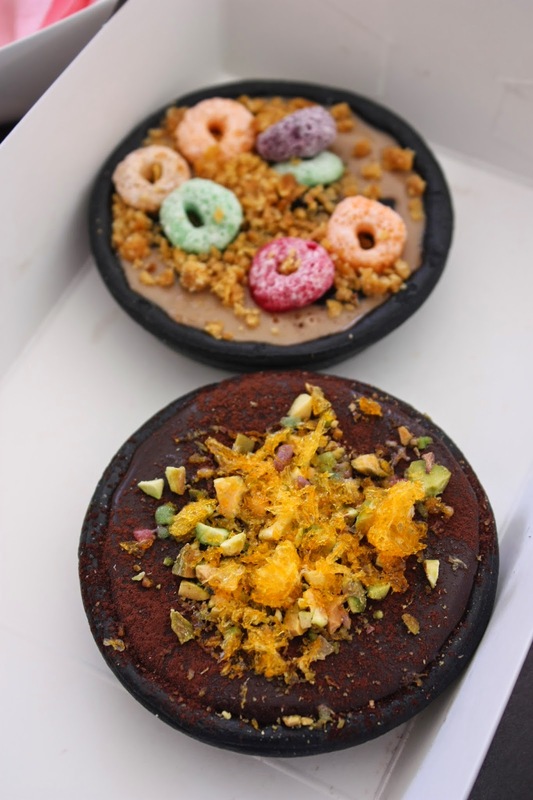 The orange puree and mango hiding underneath the surface had a nice sweet hit that broke up the heavier chocolate taste. Delicious. The pistachio and mandarin flakes were a nice addition as well. I would recommend these tarts to someone who needs to look fancy at a party when they present their dessert platter. I hope to visit the stockists of Nora Tarts in the future as in all honesty, my storage was pretty poor and I need to give them a fairer go; but at this stage their tarts definitely looked better than they tasted. I am so glad I hauled myself out of bed in the early AM to attend this carb-fest, I spent my money like a bazillionaire and don’t regret any of the purchases! A great little morning in Fitzroy Town. TL;DR If you can get down to the Flour Market you will not be dissapointed! Enter your email address to follow kit and kafoodle and receive notifications of new posts by email.